Dutch mortat team in action. The photographer has managed to capture the bomb leaving the weapon. During World War One Holland’s neutrality had been respected and during the inter-war years her government saw fit to reduce spending to an absolute minimum. Germany’s warlike stance, and warnings from well-informed sources failed to alert the Dutch government to the strong possibility that this time her neutrality would be violated. Thus it was not until April 1940 that the Dutch armed forces were mobilised. Some German officers who had misgivings about invading a neutral country informed the Dutch of the exact date of the invasion, and Dutch forces were placed on an alert from early morning on 10 May 1940. Despite the warning and many valiant acts of self-sacrifice, the German invasion was over in five days and Holland was forced to capitulate. After the war the Dutch command was blamed for this poor performance, but in fact there was little the Dutch could have done in the circumstances. The German High Command was impressed by the tenacity of the Dutch Army but it had neither the equipment, nor the appropriate training and experience to put up much more than a token resistance against the invading forces. Many Dutchmen avoided German capture and eventually reached England, where they continued their struggle. The Army consisted of a small professional cadre of 1,500 officers and 6,500 other ranks which was responsible for maintaining the military establishment, and for the training of the annual intake of 60,000 conscripts, who were eligible for eleven months military service between the ages of 20 and 40. The field army on mobilisation numbered 114,000 men, or, including reserves, 270,000 all ranks. The country was divided into four army corps based on Amsterdam, Arnhem, Breda and Amersfoort. An army corps comprised a corps staff, two infantry divisions, one or two heavy artillery regiments, one independent artillery battalion, and a signals and reconnaissance battalion. In addition, there was a light brigade (consisting of a staff, signals battalion, armoured car squadron, cyclist regiment, two hussar regiments and one horse artillery regiment) and an anti-aircraft brigade with staff and two anti-aircraft regiments. 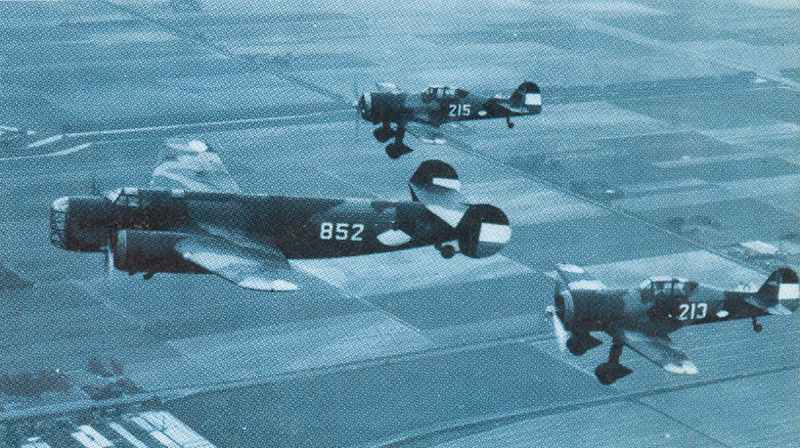 Fokker D.XXI fighters escorting Fokker T.V heavy bomber. In 1937 the Dutch government, alarmed by Germany’s warlike stance, embarked on a programme of limited expansion and re-organization of the Army Air Force. The Air Force remained part of the Army but became a semi-independent arm to which was added, in November 1938, anti-aircraft artillery, searchlight sections and air observer corps; and the whole was designated Air Defence Command. In May 1940 the active element of the Army Air Force was divided into two air regiments; the first consisting of four fighter squadrons, one bomber and one reconnaissance squadron, and the second consisting of four reconnaissance wings and two fighter squadrons. It was decided to replace the obsolete aircraft then in service (Fokker DVII fighters from World War I and Fokker CL and CV two-seater reconnaissance planes), and orders were sent out for 36 Fokker D.XXI single-seater fighters, 16 Fokker T.V bombers (see picture: D.XXI fighters escorting Fokker T.V heavy bomber), 36 Fokker G.Ia twin-engined fighters, and (from the United States) 18 Douglas DB-8A-3N attack bombers. A further 23 Curtiss Hawk 75A single-seat fighters were also ordered but these were not delivered by the invasion. On 10 May 1940 the Army Air Service had 139 operational aircraft at its disposal, although not all of them were the newer types. Nearly all of these were destroyed as a result of the German surprise attacks on Dutch airfields. Personnel losses were about 8,000 which included 500 men taken prisoner. Before the War the Dutch Navy in European waters was intended primarily for local coastal defence and mine-laying work in the North Sea; its most powerful units were stationed in the Dutch East Indies. By 1939, however, new warships were being constructed which were suitable for both the Far East and Europe. In May 1940 the Chief of Naval Staff and Commander-in-Chief of Naval Forces was Vice-Admiral J.Th. Furstner. Personnel was about 11,750 men including Marines. The Navy played a limited if courageous role in the battle for Holland. Ships patrolled the coastline giving supporting fire to land forces, and in one unique instance a Dutch ship shelled a beach on which German troop-carrying aircraft were landing. Small craft assisted by transporting troops and supplies. When defeat became inevitable, Dutch ships ferried troops across the sea, and 20,000 men reached Britain. The bulk of the Dutch Navy’s aircraft were stationed in the Dutch East Indies, although in May 1940 it disposed of 44 seaplanes and 30 training aircraft in Holland. The Naval Air Service carried out a number of reconnaissance missions and shot down one modern German fighter, but by 13 May there was hardly a serviceable aircraft left. On Tuesday 14 May, the day of the Dutch capitulation, the last six seaplanes at Veere left for France, and during the course of the day were followed by any machines able to fly. During the campaign in Holland the Naval Air Service had lost 18 seaplanes at their moorings, and all the trainers on the ground. Marines of the Rotterdam garrison marching through the town. 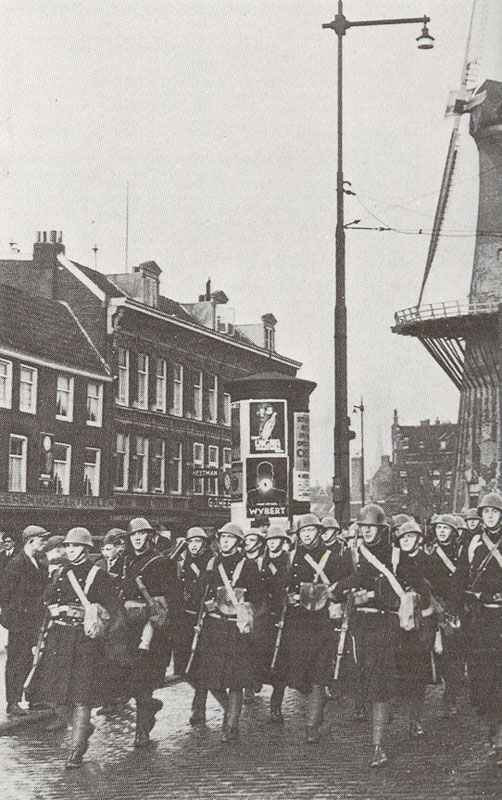 On 10 May 1940, the Korpsmariniers (originally formed in 1665 and in action against the English in 1667) was stationed in Rotterdam. The Rotterdam garrison included one hundred trained conscripts 1st Class, one hundred 3rd Class, and one hundred with only three months’ service. At the naval depot there were a further 150 Marines, 90 conscripts and 600 new recruits. 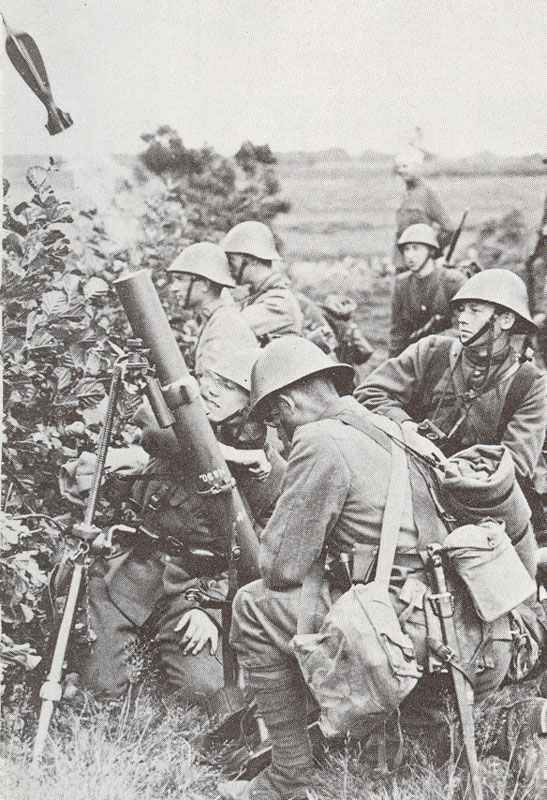 Despite their small number and lack of training, the Marines fought stubbornly against German parachute troops both on the Zuider Zee and in defence of the Maas bridges at Rotterdam, until, on 14 May 1940, they surrendered together with all other forces in Holland.